This is the weekend for celebrating Moms (who should be celebrated everyday if you want to the truth). I am excited that I get to spend time with both my Mom and Chris' Mom on Sunday. It's always fun to have a house full of family. One of the ways I am honoring my Mom is by doing a page that celebrates how thankful I am for her and the impact she has made on my life. Love you Mom. 1. Find a photo or photos of your Mom. My photo was scanned (and enlarged) and printed 6x8 inches at 300dpi. 2. Paint a background sheet of white cardstock (I used an 8.5x11 inch sheet). Use a dry brush (meaning do not dip it in water) to apply paint to the page. 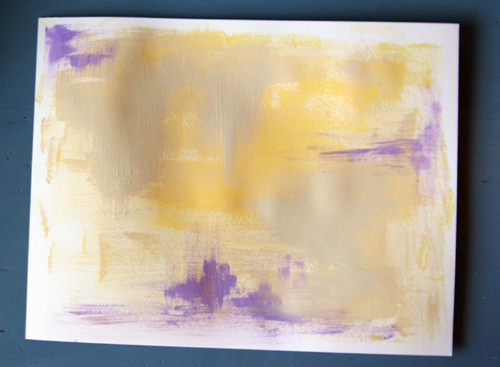 I used Claudine Hellmuth's Studio Paint in Traditional Tan, Yellow Pastel, and Purple Palette. Set aside to dry. 3. Create a new canvas in Photoshop (File/New). I made mine 4.5x8inches at 300dpi. 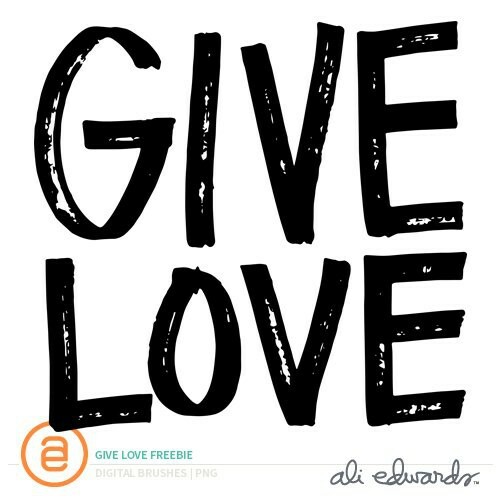 Open the Mom Word Art (or create your own) and drag and drop the .png file you want to use onto your canvas. Layer more than one if you feel like it and recolor (Edit/Fill). You could also add in other decorative brushes (such as florals) for even more depth. 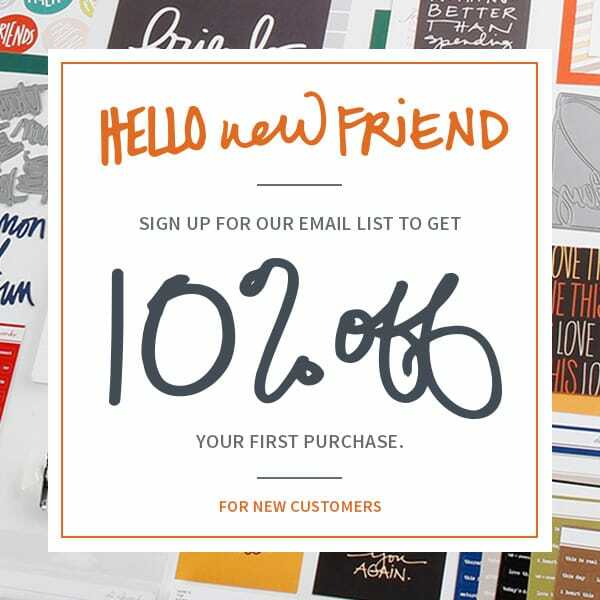 cardstock and then running through the printer to add your text. 5. 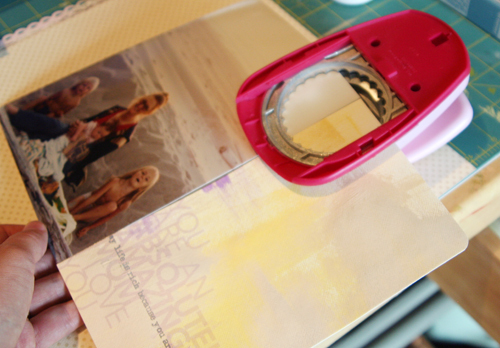 Trim your photo and your painted/text piece. Lay them together and round the outer corners. Sand around the edge. 6. 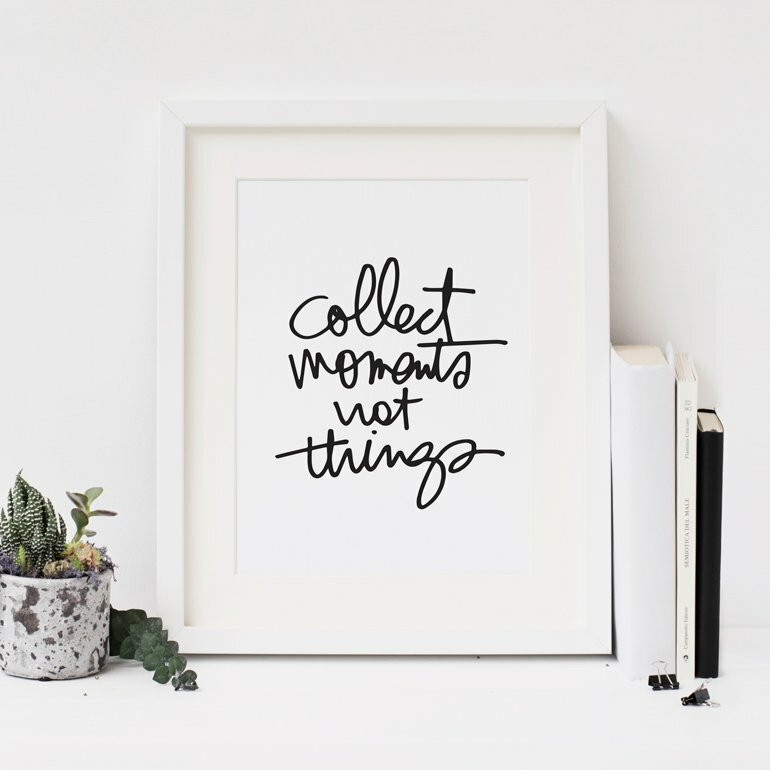 Use a piece of scotch tape to temporarily hold the photo and the painted/word art together. 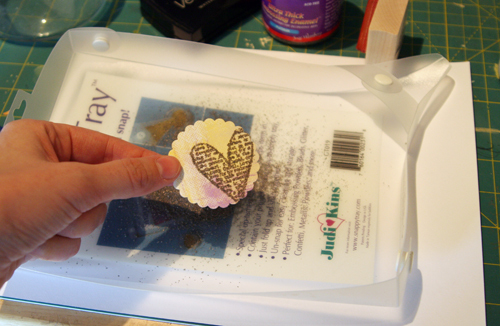 Use the pink Marvy scallop circle punch to remove a circle. 7. 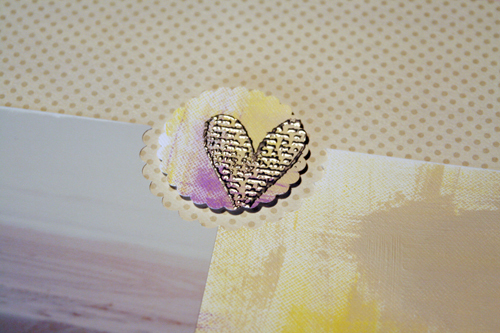 Using a leftover piece of the painted cardstock punch the smaller scallop circle. 8. 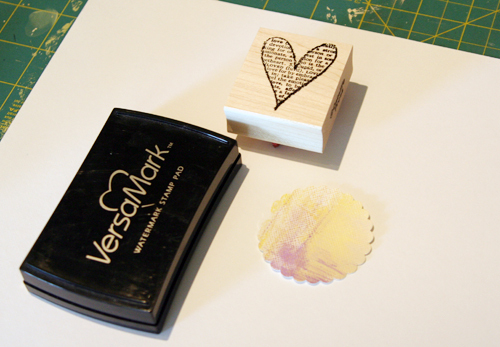 Stamp the heart using Versamark and sprinkle the platinum UTEE on top. Use a heat gun to set the powder. 9. Adhere the photo and painted/text piece to your background paper. Adhere the smaller scallop circle using foam dots or dimensional glue dots in the center of the large scallop circle. 10. Trim 1/2 inch across the top of your background paper. Using a scallop border punch choose a coordinating patterned paper and punch across all 12 inches. Trim to 1 inch and adhere behind your base piece of paper. 11. Use a sewing machine to stitch a zig-zag across the top with cream thread. Stitching across seams like this is a nice way to "join" two pieces of paper together visually (in this case I adhered the paper so the stitching is not the only thing holding it together). 12. Adhere circle ribbon over the seam where the photo and the painted paper meet. 13. Attach metal arrow turns on opposite edges with brads. 14. Place tiny letter stickers on photo. What sentiments you use will depend on the photo you are using and how much room you have. Don't forget the date. 15. Journal around the edge of the photo/painted piece. I am really liking Twitter. Lots of great ideas and link sharing going on there. Follow me here. Cloth diaper post coming this weekend. This is lovely! I always enjoy your how-to posts! Happy Mother's Day! The printing text on painted card stock looks amazing! and the painted surface doesn't affect the printer? I'll have to try that. I've been experimenting with making word art in Photoshop with colorful backgrounds made with PS brushes but the colors from the printer ink don't always match. 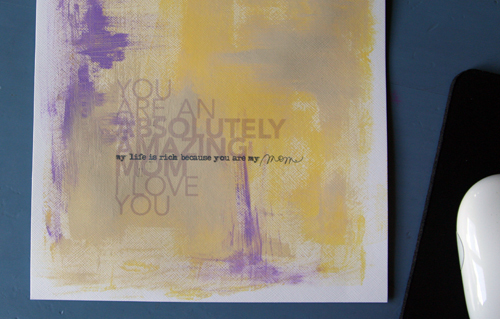 Printing the text on a painted background saves ink and gives me better control of the colors. Thanks for the great idea! You are always such a great inspiration. Thank you for the great tutorial of a lovely design. I LOVE your handwriting...do you have a font of your handwriting - seriously?? :-) Love it! love this so much! your Mom is so, so lovely - must have been cool growing up with her. and thanks for sharing the step-by-step here... sometimes I have a vision of a page but I don't know how to get there. so good of you to break it down for us. 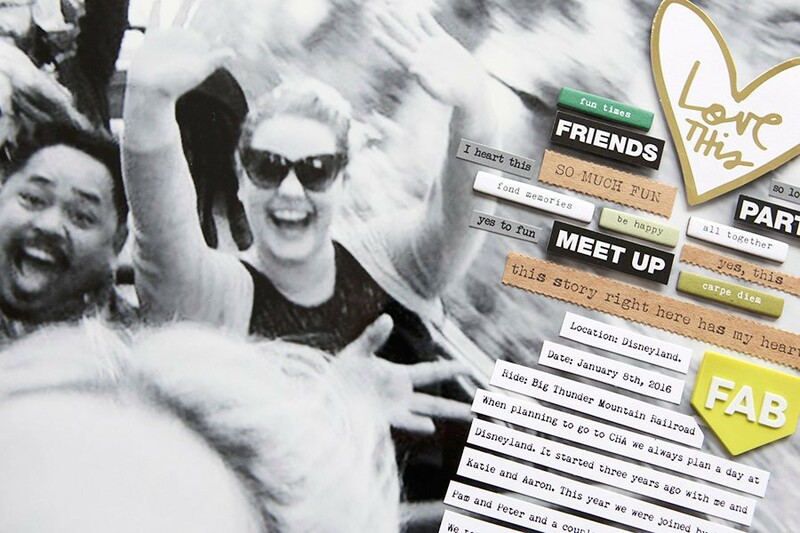 This is such a beautiful layout- the painted background with the text overlay is gorgeous! I'll use it...thanks for the idea!!! that is a gorgeous layout!! fantastic layout! happy mothers day. As always, lovely page and really great instructions. Thanks and happy mom's day to you! Great idea to make a page about your mother for Mother's Day. This is such a beautiful girly/mothery layout. I love it. Oh, I love this layout! Beautiful layout. I love it when you do your older childhood photos. This is so beautiful, Ali - love how you've broken your process down for us. Thanks so much for sharing! dear ali....i just wanted to say::you are rockin' the posts lately. everyday there are such great morsels of goodness to be had by visiting your blog. this week especially has just been great...and i think i need to go get those new brushes for mother's day! this is absolutely gorgeous! thanks for the step by step and the inspiration! Moms deserve so much! I always enjoy your how-to posts :-) Thanks!! Simply beautiful. Love the hand-painted look, too. I struggle getting my printer to accept cardstock. BUMMER. Enjoy your mother's day celebration this weekend! Ali, I loved the page. And then I loved the page even more when I saw the steps and effort that went into making it. Great job! Thank you for this page and especially for sharing the directions to make a page like this. I just lost my Mother and have been looking for some ways to make a couple nice layouts about her. Thank you so much and Happy Mothers Day. such a great idea! Going to do this for sure. Happy Mother's day. Thanks again Ali. My mom died young at 58 a year and a half ago and Mother's Day is still hard for me. I found a journal entry today of a top ten list I did about what I learned from my mom and her ordeal with cancer. I need to make this into a layout and you have inspired me yet again! It turned out great! Hope YOU have a Happy Mother's Day this year! What a gorgeous page. Thank you so much for the step-by-step on how you put it together. I'm starting to learn digi scrapping so your directions are very helpful. Wishing you a wonderful Mother's Day with your two little ones. Enjoy the weekend.